Most ships will tender you ashore to the center of town. Zakynthos Town, the main port is a typical Greek scene of white houses, fishing boats and tavernas. The focal point away from the port is the Platia Slomou, where you will find the Museum of Post-Byzantine Art (Open tue-sun, admission charge). 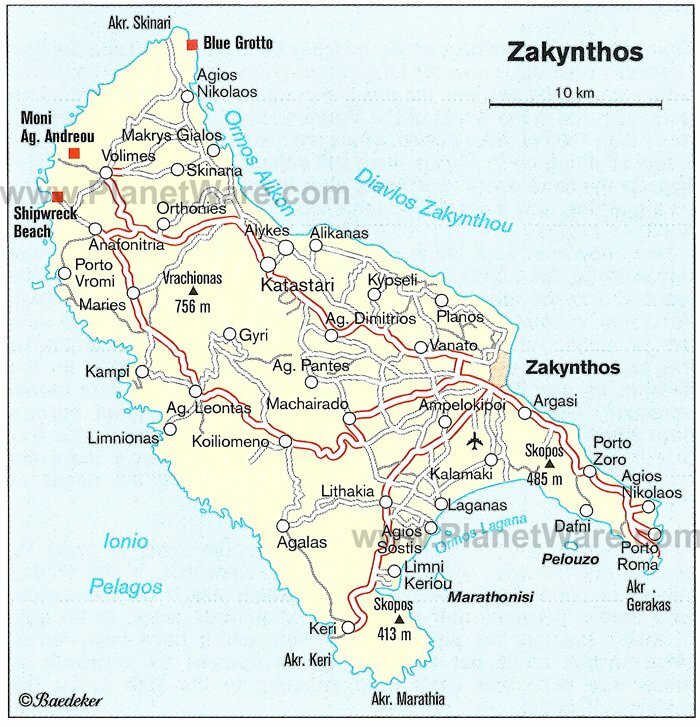 Zakynthos Island was nearly destroyed by a series of earthquakes in 1953 which leveled all but three historic buildings on the island. Zante the most southerly of the Ionian Islands has a varied landscape, the west is characterised by striking mountain scenery and is largely uninhabited and the east is packed with fertile plains, picturesque bays and long sandy beaches. Zante is a beautiful island, with many varieties of pretty colorful flowers that seem to blossom all year round. The island captured the hearts of the Venetians who ruled here for many years and who nicknamed Zante ‘Flower of the East' . There are many boat tours to the Blue Caves and the "Shipwreck"
Shop in town for local wine, honey, jewelry, leather and pottery.